SONEVA KIRI has created a new package to showcase the other face of Thailand’s emerald isle, Koh Kood, with indulgences and activities crafted around what is known on the island as the Green Season. The Green Season Escape is being offered until Oct. 31, 2014, traditionally a quiet time for the island compared to the sun-drenched hot season. “It’s a great time to experience Soneva Kiri, and we’ve put together an exciting program of activities and indulgences that allow guests to really experience the best of what can be the most beautiful of the island’s seasons,” said Frank Grassmann, Soneva Kiri’s general manager. Soneva Kiri is the sole luxury resort on the island of Koh Kood, located deep in the Gulf of Thailand, an island of outstanding natural beauty, with waterfalls that splash down through the forest into secluded coves. 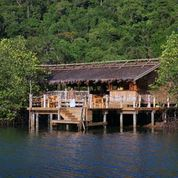 Guests can ascend to Soneva’s observatory, with its 14-inch Celestron telescope, one of the finest and most powerful lenses in Southeast Asia. The cost: Pool Villa Suite $790 per night; Cliff Pool Villa Suite $1,000 per night; Bay View Pool Villa Suite $1,300 per night; and two-Bedroom Cliff Pool Villa Suite $1,670 per night. Jim Carr’s lifelong adventure with words began as a teacher of Latin grammar for five years, followed by 17 years as a reporter, editor and columnist in daily newspapers. He left journalism to become a communications specialist for a number of national and international companies.